Why are some species admired or beloved while others are despised? An eagle or hawk circling overhead inspires awe while urban pigeons shuffling underfoot are kicked away in revulsion. Fly fishermen consider carp an unwelcome trash fish, even though the trout they hope to catch are often equally non-native. Wolves and coyotes are feared and hunted in numbers wildly disproportionate to the dangers they pose to humans and livestock. 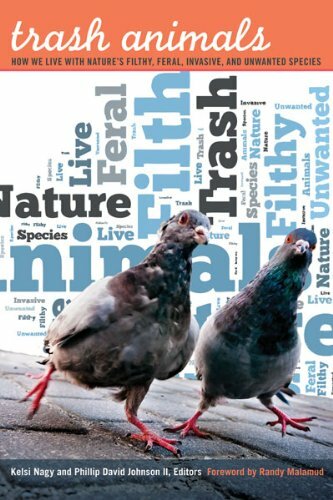 In Trash Animals, a diverse group of environmental writers explores the natural history of wildlife species deemed filthy, unwanted, invasive, or worthless, highlighting the vexed relationship humans have with such creatures. Each essay focuses on a so-called trash species—gulls, coyotes, carp, cockroaches, magpies, prairie dogs, and lubber grasshoppers, among others—examining the biology and behavior of each in contrast to the assumptions widely held about them. Identifying such animals as trash tells us nothing about problematic wildlife but rather reveals more about human expectations of, and frustrations with, the natural world. By establishing the unique place that maligned species occupy in the contemporary landscape and in our imagination, the contributors challenge us to look closely at these animals, to reimagine our ethics of engagement with such wildlife, and to question the violence with which we treat them. Perhaps our attitudes reveal more about humans than they do about the animals.